Dry weight analysis of plant material shows that on average nitrogen makes up about 6% of the dry weight. Nitrate is the preferred source but much depends on the plant species. Most vegetable crops prefer nitrates. Ammonia will damage the roots of young seedlings. That is why it is not recommended using ammonia as a fertilizer for seedlings. It is also recommended not to have more than 10-15% ammonia in the nutrient solution. The roles of nitrogen in plant metabolism link the required levels very closely with light levels. Light is the key which determines carbohydrate production through photosynthesis. Nitrogen is an important source of oxygen used for carbohydrate reduction during respiration. During periods of low light and temperature, plants require less nitrogen in relation to other plant nutrients. It can be difficult to supply nitrogen in refill solutions without adding excess amounts of other cations. The best solution is to use nitric acid (HNO3) for pH control. This can supply 50% of the nitrogen needs of the crop without adding excess cations. If extra nitrogen is required, ammonium nitrate can be added to the pH control solution. However, because ammonium decreases the uptake of other cations (K, Ca, Mg, and micro nutrients) it is not recommend to use large amounts in hydroponic solutions unless extra nitrogen is required by the crop for maximum yields. 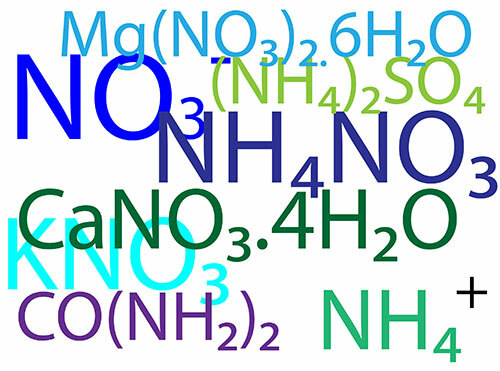 The continuous use of nitrate nitrogen in solutions can increase the pH due to the release of hydroxide ions and bicarbonates. The later are released by the plant in order to maintain electrical neutrality within the plant. Ammonium has the opposite effect. Large amounts of ammonium will decrease the pH in the nutrient solution. These effects can have a significant effect on the uptake of various nutrients.